On Saturday, 20 September 2014 I will be at Waratah Hills Vineyard conducting a lunch time masterclass of Sicilian cooking . Waratah Hills Vineyard is located on the road to the iconic Wilsons Promontory National Park. It is one of the southern most vineyards on the Australian mainland. The cool, maritime climate wine region is acknowledged as one of the best Pinot Noir producing areas in Australia. The owners are Judy and Neil Travers. They have a simple philosophy is to do everything possible to produce grapes of the highest quality. The artisan approach to detail involves hand picking by clones in small batches at just the right intensity of ripeness. Waratah Hills Vineyard was planted 17 years ago in the burgundy style of low trellising and close planting. It is a beautifully sited vineyard with two acres of Chardonnay planted on a north south slope and seven acres of Pinot Noir separated by a band of trees into two distinctly different areas of the property. In 2012 Judy and Neil Travers we were delighted to receive the Victorian Tourism Minister’s Encouragement Award for New and Emerging Tourism Businesses. On Saturday, 20 September Waratah Hills Vineyard is hosting a lunch time masterclass of Sicilian cooking conducted by Marisa Raniolo Wilkins. 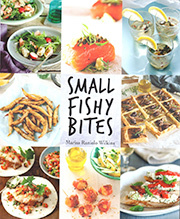 Marisa has written two books on Sicilian cooking; Sicilian Seafood Cooking and Small Fishy Bites. She is a vivacious fusion of cultures and experience. Her food is very much driven by a curiosity of exploring her cultural origins. 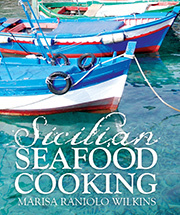 The recipes and ingredients of Sicily reflect the influences of the Mediterranean from ancient times to the modern day. Born in Sicily and raised in Trieste before migrating to Australia with her parents, she regularly visits her extended family in Italy and Sicily; each visit adding to her knowledge of first-hand wonderful food experience. Places are limited for this hands on three-course cooking, eating and drinking experience at $120 per head. Course notes and recipes are provided for you to take home. Email vineyard@waratahhills.com.au or phone 03 5683 2441 to reserve your seat at the table. The 20th September is in Spring and the menu will feature Spring produce and recipes. What could be better than a very pleasant experience in this beautiful part of the world! I cannot believe that although I have suggested salmoriglio as a dressing many times I have never provided a recipe for this very simple, Sicilian dressing which is excellent with grilled food……. fish, meat and all types of grilled vegetables – and perfect for the hot weather. In the photo above there are zucchini, eggplants and pumpkin. Peppers and mushrooms are also very good. This is the most common of the Sicilian dressings. Salmoriglio is made with salt (sale), lemon (limone), oregano (origano), hence sal + mo + riglio. It is also called salmorigano. 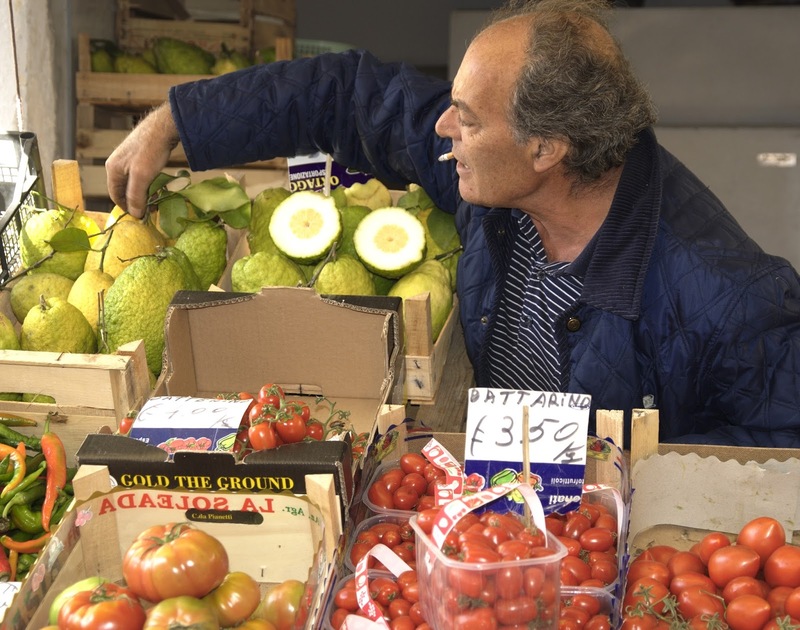 In Sicilian, there are many variations to the spelling of the sauce — sammurigghiu, sarmurigghiu, sarmuriggiu. The origins of salmoriglio are Greek and traditionally the cold dressing is poured over hot, grilled meat, fish or vegetables. The heat releases the aromas and stimulates the appetite. It is also a marinade, or a basting liquid for grilled meat or fish. Use a fork to whip the above ingredients together in a glass or narrow jug. Add a little hot water to the dressing. Heat in a bain marie for about 5 minutes The heating of the sauce accentuates the fragrances of the ingredients. I have seen a recipe where fresh oregano (4 tablespoons) is pounded with salt (1 tablespoon) in a mortar and pestle. Add 2 tablespoons of lemon juice, 8 of oil and some black pepper. My family has always added ½ cup of parsley and 1 clove of mashed garlic. During my most recent trip to Italy I was amazed to see how many hip bars specialise inmaking burgers. 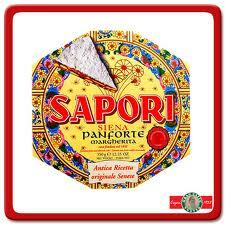 They are considered a fashionable snack to accompany wine or beer. Sliders are perfect food for when you’re entertaining—they are the perfect size to hold and so easy to slide into your mouth. Cut the fish into chunks and mince using a meat grinder or food processor—I do not like the mixture to be too fine. Combine all of the ingredients except the oil—the mixture should be quite firm and hold its shape. You may need a few more breadcrumbs, depending on the type of fish you use. Shape into 6 balls and flatten them slightly. Fry them in hot oil and drain them on some kitchen paper. Stuff the patties into rolls and place a dollop of herb paste into them before serving. Hold the rolls together with a toothpick or a small metal skewer. A simple paste can be made with any of the following fresh herbs: coriander, basil, mint, tarragon or chervil. My preferred method is to chop the herbs finely and mix all of the ingredients by hand. Rather than using olive oil, you can use egg mayonnaise. 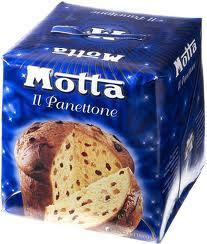 I use marsala fina or secca (dry) for my cooking. It is nothing like marsala all’uovo – unfortunately this has given marsala a bad name. Marsala is the fortified wine of Sicily. Like sherry, there are various blends and some is aged in wood for longer than ten years; it is called marsala stravecchia and as noble as any good liqueur. Those of you who have been to Sicily and have visited the Cantine Florio in Marsala, in the province of Trapani would know what I am talking about. The squid are stuffed with fresh cheese. Being a Sicilian/ Italian recipe, the soft cheese used for the stuffing can be one of the following: tuma, pecorino fresco, mozzarella, fior di latte, bocconcini and even ricotta….and not the tub variety! On this occasion I used Danish feta – definitely not traditional, but I had some marinading in extra virgin olive oil, dry oregano and fennel seeds in the fridge. For a main course estimate 1 squid per person – these are medium sized squid – usually the smaller the better as large squid can be a bit rubbery. For an antipasto the squid can be cut into slices and feed 6 people. 4 medium squid 1 cup breadcrumbs (small), made from good-quality day-old bread 2 tablespoons flat-leaf parsley, finely cut ¼–½ teaspoon nutmeg 150g fresh cheese cut into small cubes (see above) 1 cup dry marsala 3 tablespoons extra virgin olive oil salt and freshly ground pepper to taste. Clean the squid: pull off the head and the inside of the squid and discard. Cut off tentacles and save them for another time. Toast the breadcrumbs in a little oil. Cool. Mix the breadcrumbs, cheese, parsley and nutmeg together and add the seasoning. Stuff the squid and secure each end with a skewer. Sauté each squid in olive oil. When golden, add the marsala, cover and simmer for 10-15 minutes (depending on size). Uncover and evaporate the juices as necessary. Two of my friends live on Waiheke Island in the Hauraki Gulf of New Zealand, located about 17.7 km from Auckland. They both have kayaks and when time and weather permits one or two of them go fishing and it seems that every time they do, they catch fish. They catch mainly snapper off Oretangi Beach where they live, but if they go to some of the other bays they catch John Dory, Kingfish and Hapuka. The fish in the three photos were caught on two separate occasions and when I stayed with them we enjoyed eating fresh fish very much . 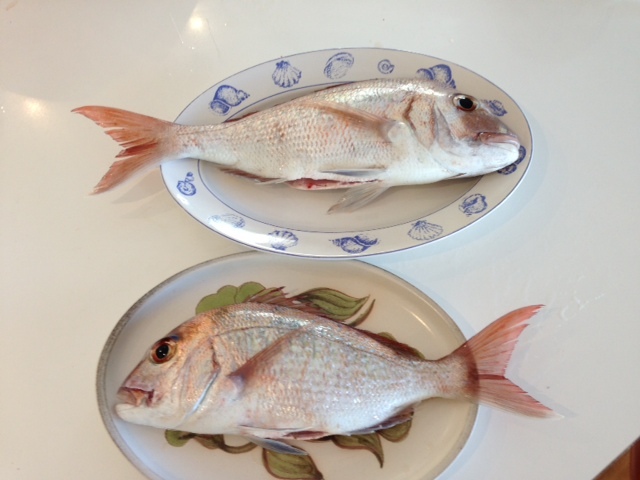 My friend boned one of the fish, a Kawhai, a New Zealand fish which needs to be bled. He smoked it using a simple smoker and manuka wood smoking chips. We cooked some of the snapper in colourful, enamelled, cast-iron mini “casseroles” or “dutch ovens” using simple Sicilian flavours: tomatoes, capers, garlic, olives and some Sicilian common herbs.. They are brought to the table straight from the oven so do tell your guests to be ultra careful when they eat from them. Also protect your table with mats. Of course the ingredients can go into one large casserole, covered and baked for 25-30 minutes. Heat the extra virgin olive oil in a frying pan and pan-fry the fish lightly. Add a little salt. Remove the fish and set aside. fish in each and top with more tomato. Either cover with a lid or if using a different type of ovenproof small baking dishes cover with metal foil and bake for 7-10 minutes, depending on how cooked you like your fish. I quite often use jam (good ones, lots of fruit and not too sweet) in desserts and sometimes I use them as a base for sweet sauces to accompany cakes, crepes, fruit salads and puddings. 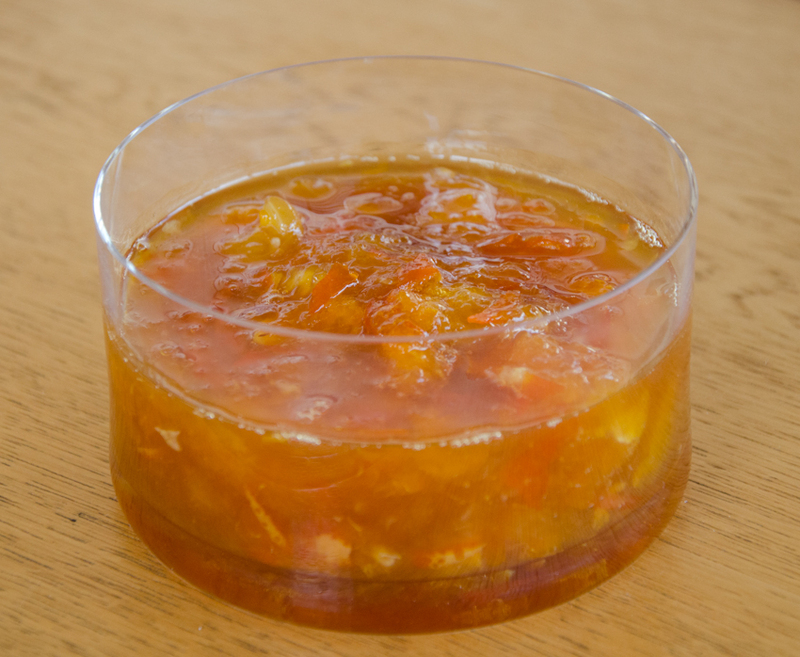 This time I wanted to make a strong tasting citrus jam that I could use to make an ancient Sicilian dessert. Sicily is the land of citrus. I love honey and I frequently use it in the place of sugar and when I make jam I also often add some liqueurs or spirit. For example in this recipe I could easily have added a tablespoon of an orange or lemon flavoured liqueur – Cointreau or Grand Marnier. I removed some of the peel from the tangelo and cut some of it very thinly. Peel /cut off all skin and white pith and discard. Chop fruit roughly, discard seeds( these make the jam bitter). Place pulp and water in a saucepan, cover, bring to the boil, reduce heat and simmer 20 minutes. Add honey, and boil it uncovered, without stirring, for about 20 minutes or until set (semisolid). If adding liqueur add about 2 tablespoons towards the end of cooking or if making a sweet sauce add the liqueur to thin the jam.